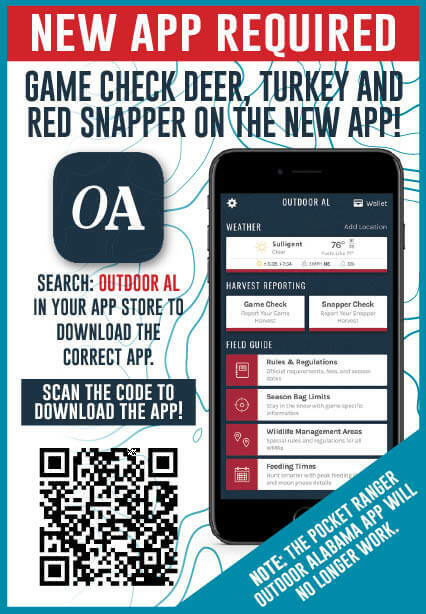 Download the new OUTDOOR AL app. Note the Pocket Ranger Outdoor Alabama App will no longer work. Hunters cannot bring any deer carcass into Alabama unless it has been properly prepared. Unantlered Deer Season Boundary in zone C has been reduced in size (Deer Seasons & Bag Limits). Crossbows added to legal arms for Turkey (Legal Arms & Ammunition). Handguns removed as legal arms for Turkey (Legal Arms & Ammunition). Spear removed as legal arms for Whitetail Deer (Legal Arms & Ammunition). Opening date of Spring Turkey Season has moved to March 16 (Other Seasons & Bag Limits). Increased Pintail from 1 to 2 (Other Seasons & Bag Limits). Prohibition of harvest of Walleye in the Mulberry Fork River and its tributary streams in Blount, Cullman, Lawrence, Walker or Winston counties (Fishing Daily Creel, Possession & Size Limits). Purple paint may be used to designate no trespassing. See Code of Alabama 13A-7-1 (Purple Paint Protects Property). Hunt Over Bait: Despite false information and rumors, no changes have been made to the state’s baiting law (9-11-244). The practice of hunting game animals by the aid of bait remains illegal in this state and violations of this law will continue to be enforced. See Deer Seasons & Bag Limits for Area Definition Regulation. Fail to Report Harvest: Many warnings were issued by the state’s Conservation Enforcement Officers during the last hunting seasons for violations of the Game Check Regulation. This season any violation of this regulation will result in the issuance of citations which have monetary fines attached to them. See Mandatory for all Deer & Turkey Hunters for further information on the Game Check System. Import Prohibited Deer Parts: It is unlawful for persons hunting outside of Alabama to bring deer, elk, moose or caribou carcasses, hides or antlers back to Alabama from any other location unless all meat has been deboned and skull plates and hides have been thoroughly cleaned of all brain and spinal cord tissue. The Wildlife & Freshwater Fisheries Division needs your email address so you can receive updates and other information from the Wildlife & Freshwater Fisheries Division! 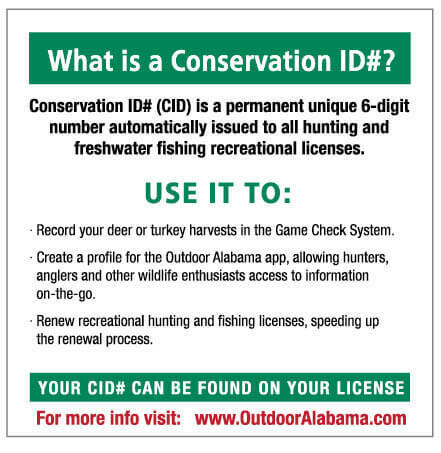 Be sure to provide your email address when you buy your license or go to www.outdooralabama.com and sign up!